This book examines problems with women oppression in many countries around the world and what and how we can do something about this. There are many horrific personal stories included in this book, with an argument tied to how this problem should and can be tackled. There are also a lot of interesting studies citied to help provide the facts to go along with the personal stories. There were some very interesting points raised. I had no idea that iodine deficiency was such a problem to child development, and who knew that bringing tv into rural areas could decrease the amount of home violence. The authors tried to cover a lot of ground in this book, which meant that some of the stories had to be quite short and gave a rather stilted feel to this book. In these kinds of books, the subject can get quite dull but that wasn't the case for this one because of all the stories that helped you connect to the underlying issues. First Line: "Srey Rath is a self-confident Cambodian teenager whose black hair tumbles over a round, light brown face." Sarah Havensworth is blessed to have a husband that has allowed her to stop work and focus on her novel, but Sarah is having problems finding inspiration. Coming from a journalism background, Sarah finally finds a spark when she reads about two dressmakers that went missing in late 1800 San Francisco. Sarah re-focuses what she's working on. Someone finds out and starts sending her threatening emails. Determined to write this story, Sarah continues on and the story of the two dressmakers come to life. In 1876, there are two immigrant dressmakers that want more for themselves and their families. When a handsome young man comes in to get some clothing tailored and treats the two girls well, they swoon. This man ends up being a Havensworth, from Sarah's husband's family. When one of the dressmakers goes missing, the other enlists Havensworth's help to try and find her. Sarah and one of the dressmakers, Hannelore, have a lot in common. They come from less privileged lives and fall for men much better off than them. This book is a very easy read. It's easy to connect to the characters, though they were a bit over-dramatic, and pull for them. The two stories flow very well with each other. Both 1870s San Francisco and present day San Fran were portrayed very well and made you feel like you were in the city then and now. I've only been to San Francisco once but could remember pieces of it and tried to paint over what I remembered with the 1870s description from Jaeger. Overall, an incredibly strong debut from Jaeger. I'm looking forward to more from her. Thank you to TLC Book Tours for letting me be a part of this tour. If you want to purchase the book, you can do so here. First Line: "A doorman ushered me toward the historic garden court inside the Palace Hotel, the sequins on my gold shift dress catching the light." Find her on Facebook, Twitter, or at her website. A group of students (college or high school? It's never quite clear) decide to pull a prank and rather than go out on a trip with the school, go to a never used part of the school that has a few rooms inaccessible by anything other than a ladder. The group plans on staying for three days before a friend will let them out. The premise of this book makes no sense. How is it a "practical joke" that instead of going on a trip, you're spending it in a hole? It made no sense to me what they wanted to accomplish by this experiment. Then there was the narrative. It switched between the kids in the hole and one of them outside of the hole, after they made it out. But when you first start reading it, there's no indication that this is the case and you're left wondering what the heck is going on. This book isn't all bad though. The twist at the end is quite good. Unfortunately at that point I didn't care because everything else about the book was so awful. I don't recommend this one at all. First Line: "In the last Easter term, before the Hole, life was bright and good at Our Glorious School." Vivian is an Irish immigrant who settles in New York city in the early 1900s with her mom, dad, and family. Tragedy befalls the family and Vivian is left an orphan. As such, her journey begins on the orphan train, where all orphans are packed on a train together and basically paraded through different cities in the USA until someone agrees to take them in. Vivian befriends a baby and a boy on the train and hopes to be able to find them again, but they are taken by families quickly. Vivian's heart begins to fall, wondering if no one wants her. Instead, Vivian ends up in Minnesota, taken by a couple that owns a female dress making shop. They only want Vivian for free labour, so she learns to sew. As the great depression happens, her circumstances in the "family" change and they no longer want her. Vivian gets passed on and passed on, struggling to survive and not feeling like she's wanted anywhere. In present day Maine, Molly is also in foster care. She doesn't get along with her family and when she steals a book from the library, that's pretty much the last straw. Molly ends up doing community service for Vivian and learning all about her past. The two become unlikely friends. I'm sure we've all read stories about horrible foster families in the past. And this book certainly has an element of that, but it's much more about overcoming these challenges and how it shapes you as a person. Yes, both Vivian and Molly don't have ideal pasts, but really, how many of us do? They triumph over these. I really enjoyed Vivian's story. 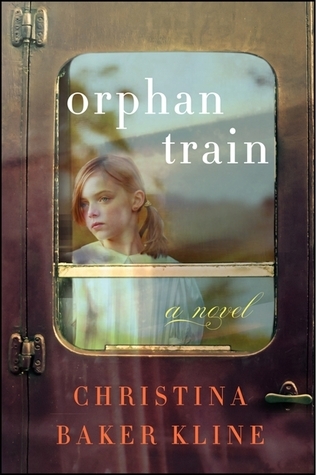 I had never known anything about orphan trains. I feel like there's a good non-fiction novel that could be made about these people's stories. This book read incredibly easy because the character were so engaging. What a great way to start 2017 reading! You can purchase this book at Harper Collins' site. First Line: "I believe in ghosts."